Our Insect Technician Adam Simmons (pictured) has lots of experience breeding our mantids. Here he’s gathered together his top tips for mantis breeding success. The female mantis should be fed 2 crickets each day for 3 days prior to mating. The male mantis can be fed his usual diet prior to mating. On mating day, place the female in the centre of fairly large cage with suitable ventilation holes. Keep the lid off. The example shown below is an Exo Terra Flat Faunarium Large PT2310, which is 460mm long and 300mm wide. Have a refuge area for the male. If he retreats here, he’s likely not interested in mating so try again another day. We used sterilised twigs and artificial foliage for our refuge area. The male can be fed a cricket prior to mating, but they don’t have the same hunger drive as females so may choose not to eat. Don’t force it to eat. Place a few crickets in the cage with the female. Make sure she is feasting on (at least) one before introducing the male. At this point the female should be fairly well satiated and shouldn’t mind his presence. She may still be slowly munching on a cricket. Observe from a distance, don’t peer over the cage. The male will usually stay mounted like this for a few hours prior to copulation. He wants to make sure the female is happy with his presence. Eventually the abdomens will join, as shown below. They can stay like this for several hours, although sometimes the process is quicker. If the male is attacked by the female at any stage, vigorously shaking the cage or carefully prodding the female with a twig should separate them. If this happens, try another day. Give the female another few crickets in the meantime. You can leave them together over night, after mating. But if you wish to save the male for future use, separate them when mating is complete (abdomens no longer joined and male has unmounted). Otherwise you can leave them together until the male is eaten – this is a good source of nutrition for the female. 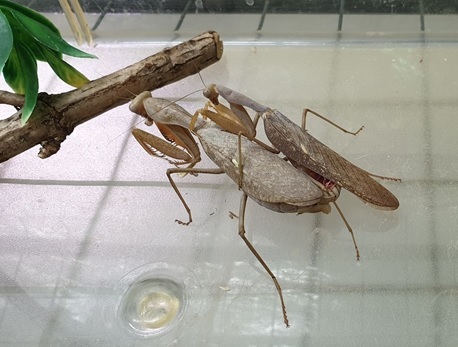 The mating cage used in this example is a good size for mantis hatchlings. The female can be left in this cage to lay her fertile ootheca. Be sure to cover the cage with a breathable cloth sheet (e.g. muslin) and put the lid on. A fertile ootheca may be laid very soon after mating, but it can also take several days. Feed the female her usual diet after mating, ensuring at least 3 feeding sessions per week. Leave the ootheca in the position it is laid. During the mating shown here, the ootheca (below) was laid on the muslin cloth placed at the top of the cage. The ootheca laid by different species may look quite different to the Sphodromantis ootheca below. Once the fertile ootheca has been laid place the female back in her original cage. If there are ventilation holes on the cage where the ootheca has been laid, make sure you cover them carefully with tape. The sticky side of the tape should face outwards and no exposed sticky surface should be found inside the cage. The breathable bottom cloth in conjunction with ventilation holes on the cage lid will be sufficient. The mating process and producing a fertile ootheca is energetically expensive and it’s not unusual for the female to die shortly afterwards. It may not, however. 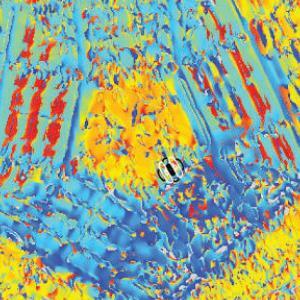 And subsequent oothecae laid may also be fertile, albeit typically with a lower yield of hatchlings than the first. If any further oothecae are laid, they can be placed inside a cage of similar design to the initial breeding cage. Most oothecae (as with the Sphodromantis ootheca on the previous page) have a flat surface which they will stick to a wall of the cage. If you are transferring an ootheca to another cage, make sure the rounded (non-flat) side is not touching anything in the cage. You may wish to simply put the fertile female in another cage set up like the first one and wait for the ootheca to be laid, rather than trying to transfer any oothecae. It usually takes 2-3 months after a fertile ootheca is laid for hatchlings to emerge. Sometimes it is slightly quicker, sometimes it takes slightly longer. As with other animals, mantids sometimes have fertility issues which will mean that the ootheca that has been laid is not fertile. If hatchlings don’t emerge after 4 months you can assume that they won’t and will have to try with another pair. A minimum temperature of 20°C with relative humidity of at least 40% will be sufficient for Sphodromantis They are quite resilient and have been known to hatch below this, however. The typical yield for a Sphodromantis or Hierodula ootheca is 80 – 120 hatchlings, but there is significant variation between oothecae and species. The mantids will require a good source of hydration when they emerge. A small dish containing polyacrylamide gel (Bug Gel or similar) and a small bottle filled with moist cotton wool can be used for this. It is best to place the hydration sources in the cage after the mantids emerge from the ootheca. Otherwise the bug gel will simply dry up and the cotton wool may dry out of become mouldy. Whether before or after hatching, check the polyacrylamide gel and cotton wool regularly and replace as necessary. Also ensure the cotton wool is packed tightly, you don’t want a pool of water on the top as this will drown some of the small mantids. 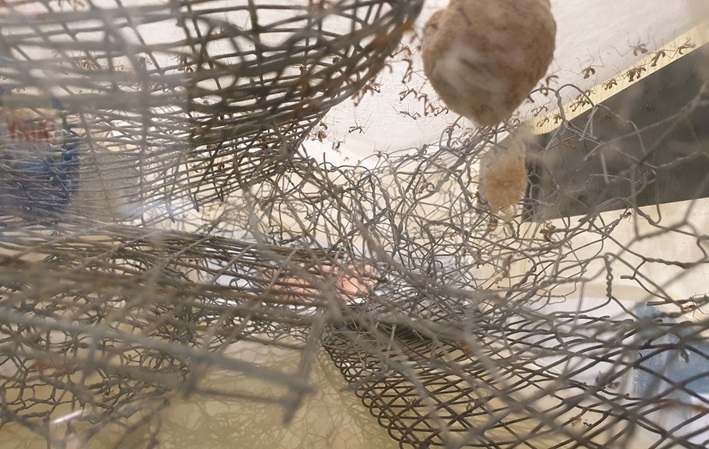 The image below shows a side-view of the cage and its 3D structure following hatching of the ootheca. 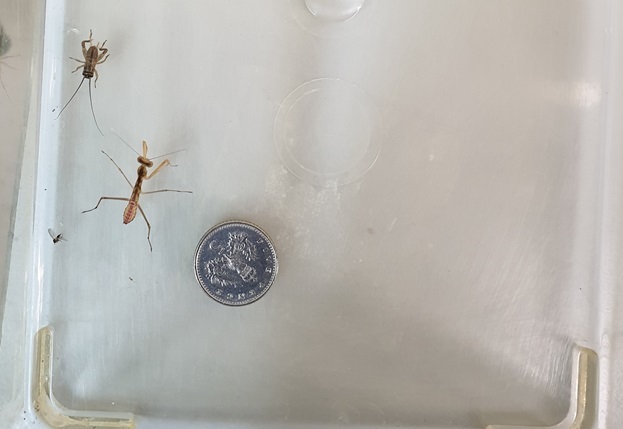 Note how small the young mantids are when they first emerge. One day after the mantids emerge, they can be fed a diet of drosophila. You can use a flightless variety if preferred as they’re easier to deal with and keep in the cage. You should fill the cage up generously with drosophila at least every other day. Having a good and fairly constant food source is important to keep the young hatchlings occupied and minimise cannibalism. The cage with hatchlings should be kept in similar conditions to the ootheca. A minimum temperature of 20°C at a relative humidity of at least 40% is a good target for Sphodromantis and Hierodula Keeping the cage near a humidifier which will periodically spray the cage and attempt to keep the humidity levels at this target level is a good idea. If a humidifier isn’t practical, you can periodically mist the top of the cage with water. Every other day should be sufficient, but do not overspray and make sure that water isn’t dripping down and forming pools on the bottom of the cage. The mantids can be separated out at 3rd – 4th instar and placed in their own cage. This cage can be used for the entire life of the mantis, provided it’s a suitable size. 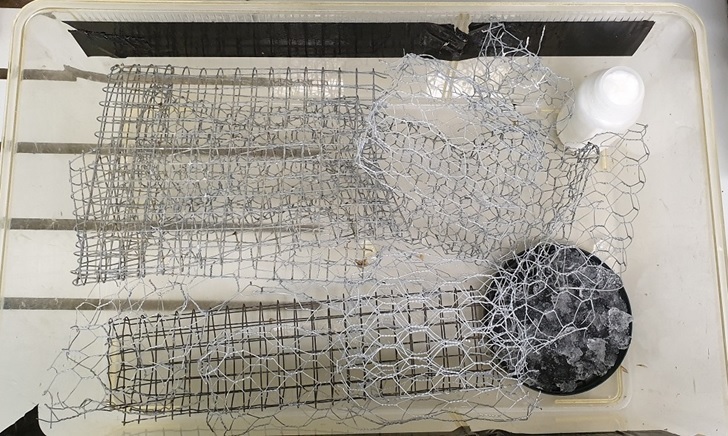 Ensure netting (tulle) is provided at the top of the cage to assist with moulting. At this stage of life they can be fed with small crickets. Sphodromantis and Hierodula should reach this stage approximately 4 – 6 weeks after emerging. A 3rd instar Sphodromantis lineola is shown below. Its body length is approximately equal to the diameter of a 5p coin. Some individuals will be slightly larger at this stage, but the 5p coin is a good approximate guide – once it’s at least as long as the coin’s diameter it can be separated into its own cage.